The 60/20/20 Weight Loss Plan. Diets are hard, and there are a million of them out there. Some work for some people, but not others. I tend to stick to the American Diabetes Association’s recommendations, with some tweaking. That’s what the Jenny Craig diet was based on, at least while I was working there (and it probably still is). Sure, while I worked there, I drank the cool-aid, so to speak. But after trying some other diets based on other nutritional breakdowns, I believe the Jenny Craig way I learned is the way to go, at least for me. Ginny is almost 4 years old, which means its been that long since I worked at Jenny Craig. That’s kind of crazy. Weight loss consulting used to be my life. Now its more like all I do is try not to let my own weight get the better of me. So in an effort to both remember and share my weight loss knowledge, I thought I’d break down what I’ve learned about a good weight loss plan as far as what should be consumed. Nutrition Disclaimer: I am not a certified nutritionist…these are just the calculations I’m pretty sure are close to correct. The information contained herein is not intended to be a substitute for professional medical advice, diagnosis or treatment in any manner. Always seek the advice of your physician or other qualified health provider with any questions you may have regarding any medical condition and before beginning any nutritional program or exercise program. I’d really recommend MyFitnessPal to get this information. Most women will be in the 1200 to 1500 range (that’s calories per day to lose 1 to 2lbs a week). Breastfeeding women will probably be around 1800. Most men will be around 1700 to 2000 calories. MyFitnessPal will automatically set your goals at 50% carbs, 30% fat, and 20% protein (that’s the percentage of the food you eat over the course of the day). I think 30% fat is way too much. I’ve seen people stick to their calorie goal but eat 30% fat daily, and they didn’t lose much weight. 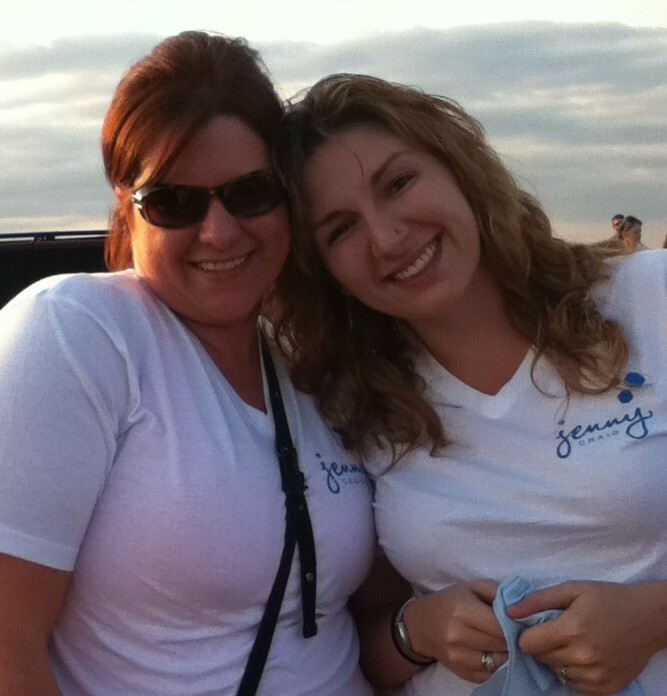 At Jenny Craig, our balance was 60/20/20. That’s 60% carbs, 20% fat, and 20% protein. 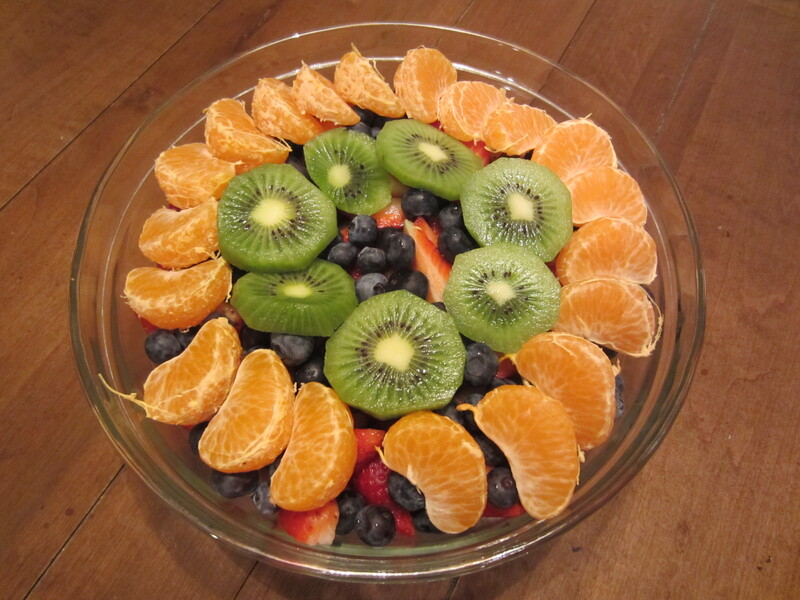 Getting a colorful variety of phytonutrients can be as easy as eating a fruit salad! To learn more, read my post, Why Eat Across the Rainbow? Here’s the dietary exchange meal breakdown based on exchange servings of different foods that I try to stick to. It’s not exactly what Jenny recommends to clients when they reach halfway, but its based on the Jenny Craig foods that they use in their meal plans. To figure out what counts as a starch, fat, protein, etc, I recommend American Diabetes Association’s The Official Pocket Guide to Diabetic Food Choices. But you can do some research online and in other books to find this information (such as the Jenny Craig Pocket Guide), since the American Diabetes Association does make this information public. (Or, you can log alcohol as fruit, which is admittedly what I do, but that’s not very healthy since alcohol is all empty calories). If you want, 1 Milk = 2 Meat. And for more on what counts as a Milk, read my post, Milk Substitutes and a Note on Almond Milk. I want you to understand, these are all guidelines. None of this is exact. If you look at the dietary exchange of Jenny Craig lunches for example, you’ll see that one lunch is 1.5 Starch, 2 Meat, another is 2 Starch, 1 Meat, 1 Fat, another is 2 Starch, 1.5 Meat, .5 Fat, and another is 2 Starch, 2 Meat. Their breakfasts, dinners, and snacks are just as inconsistent. The idea is to try and balance your day. For that, I highly recommend using a food logging website or app. MyFitnessPal is excellent, although if you don’t want your nutrition goals to be based on 30% Fat, you’ll have to adjust your nutritional goals to 60/20/20, or whatever you decide to do. MyFitnessPal won’t break your food down into these exchanges, but it will tell you the amount of carbs, fat, and protein that you’re consuming, and you can adjust accordingly. And don’t forget, I provide the dietary exchange info for all my recipes on this blog. Many cookbooks do as well, and some products are including exchanges in their nutrition info (like a lot of cereals, for example). So the information is out there.